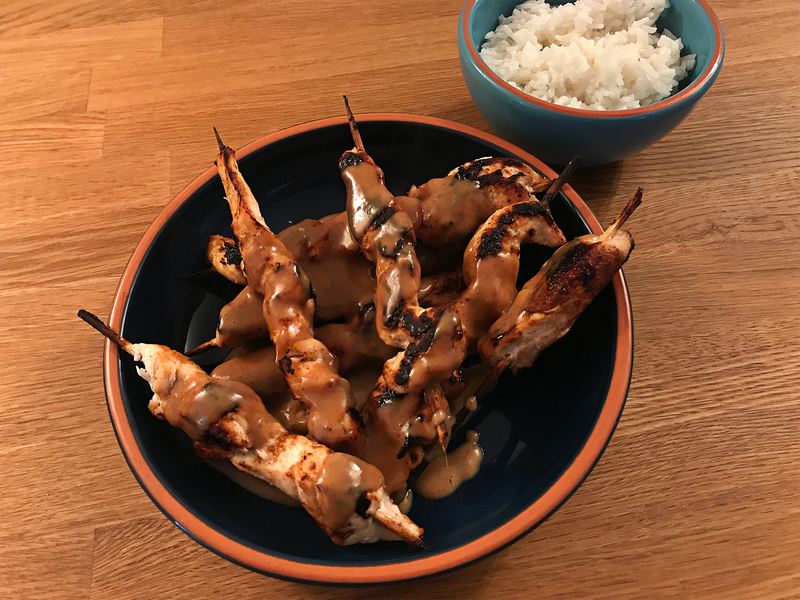 I tried this recipe for chicken satay skewers tonight as a "recipe test", and after posting on Instagram I had a few requests for the recipe so I thought I'd post it up here for people to reference. The peanut sauce is taken from the Chicken Gyoza recipe - mix this up first and you're good to go for the marinade! The ingredients are simple, and if you follow this method, the process is quite a quick one. First, make up the peanut sauce using the recipe here. You may want to double the amount of the sauce to ensure you have enough to smother the chicken (I used extra peanut butter to make it more nutty!). Please your sliced chicken into a bowl, add around 1 tbsp of the uncooked peanut sauce to the bowl. Mix well to coat the chicken, cover the bowl with cling film and leave to marinate for a minimum of 20 minutes (overnight as always good). Once your chicken has marinated, soak some wooden skewers in water for around 30 minutes, this will prevent them from catching fire in the grill. New place the chicken onto the skewers, ensuring an even amount per skewer. I tend to break long skewers in half as I find a smaller size easier to manage. Before we cook the skewers, we’ll get the rice cooking. Place the rice into a pan, cover with 3/4 cup of water, a pinch of salt and a tsp of rapeseed or olive oil (this prevents the rice from sticking). Place on the smallest ring on your hob, over a high heat until it boils, before reducing right down and placing the lid on. Cook for 12-13 minutes (if you have a glass lid, look to see if all the water has gone), then remove from the heat and leave to steam with the lid on for 5-10 minutes. While your rice is cooking, cover a baking tray with foil and line your chicken skewers onto the tray. Turn your grill on, and place the skewers underneath. To ensure these cook evenly, you’ll want to turn them every couple of minutes or so, as this will also prevent them from catching quickly. Keep cooking until you’re happy they’re cooked through. Just before the skewers are cooked, place your peanut sauce in a small pan and heat until warmed through, stirring repeatedly for a few minutes, this will combine everything together. By this time your chicken should be cooked, your rice will have pinged and your sauce will warmed through, so it’s time to serve up! I like to serve the skewers in a bowl, smother them with the sauce and eat them one by one with my bowl of rice. Any excuse to get stuck in!